God is doing great and awesome things, come let's seek his heart together. Our Women's Ministries group meets once a month. 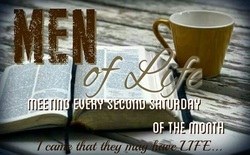 All ladies are welcome to come and fellowship with us. Enjoy great conversation and good foods we get to know each other better and more importantly feed our souls. ​We want to help each woman discover and develop their gifts, talents, and abilities so that they can effectively touch their world for Christ! Thank you to all who prayed about and said, "Yes!" ​Yes to supporting Life Ministries Church, first in prayer and with your tithe. ​And Yes to supporting Life Ministries Church with a financial contribution, as it pays off the church mortgage and prepares to build a new church. MEN OF LIFE: We meet every 2nd Saturday of the month. ​Men of all ages coming together to grow in relationship with Jesus Christ, and to encourage each other as servant leaders in our homes, our church, and our community. Come and join us for a breakfast, fellowship and bible study. Don't Miss Out!!! The Lord is doing AWESOME things within this ministry.